We sat out yesterday’s 2 games after a frustrating Tuesday when we dropped our 3 favourite bets of the day and went 4-4 on leans. With just 4 days remaining in the regular season and so many question marks when it comes to focus and motivational levels of a lot of these players and teams, we’re going to lay off for the rest of the regular season when it comes to picks and opinions. Our posted plays and leans finish with an overall record of 427-385 for +21 units. Even though a cold run over the final month really put a damper on things, we’re pleased with that record, considering how difficult it is to turn a profit making picks on virtually every game on the board. However, this site is more intended to be a resource of information to help you make your own picks than a site that simply tells you who to bet on. So we’ll continue with the usual stats, trends and other information for all the games until the season concludes. 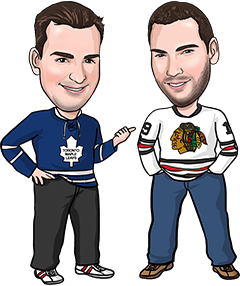 Also wanted to let you guys know about a free Stanley Cup playoff contest we’re planning for next week to thank everyone for their support all season. We’ll be rolling out more details on that in the next few days. Good luck if you’re betting on any of the action tonight! Reasons to bet Ottawa: The Senators have won all 3 meetings with Boston this year and 4 of their last 5 visits to Boston. Ottawa still hasn’t clinched a playoff spot but Boston has. Reasons to bet Boston: The Bruins have won 6 straight games, allowing 2 goals or less in each of those games. Ottawa has scored 2 goals or less in 7 of 9, and has lost 5 straight road games. Reasons to bet New York: The Islanders will be eliminated from playoff contention with a loss. New York has won 3 straight, including a 2-1 OT victory Tuesday in Nashville. Carolina has lost 3 straight and is no longer in contention for a playoff spot. Reasons to bet Carolina: The Hurricanes are 23-11-5 at home this season and are 3-0-1 versus New York this season. The Islanders are without leading scorer and captain Tavares for the rest of the season. Reasons to bet Pittsburgh: The Penguins are 4-0 against New Jersey this year and 6-1 in the last 7 meetings. The Devils have not won in regulation time in their last 10 games (2-6-2) and have scored 1 goal or less in 5 of their last 6. Reasons to bet New Jersey: The Devils have won 15 of their last 25 home games versus the Penguins. Pittsburgh could still be reeling from yesterday’s announcement that Letang will miss the upcoming playoffs. Reasons to bet Winnipeg: The Jets are a respectable 17-17-6 on the road this year and have won 5 straight games, scoring 4+ goals in each of their last 4. The Blue Jackets have lost 4 straight and scored 2 goals or less in 7 of their last 8 outings. Reasons to bet Columbus: The Blue Jackets still have a chance to catch Pittsburgh for second in the Metropolitan Division, and are also desperate to break out of their current offensive slump in time for the playoffs. Reasons to bet Tampa: Must-win game for the Lightning as it still has a chance to catch the Leafs or Senators for the last playoff spot in the East. Toronto has lost 3 of its last 4 home games versus Tampa. Reasons to bet Toronto: The Leafs should have a sense of urgency tonight since their remaining games are against the Penguins and Blue Jackets. Tampa has allowed 3 goals or more in 8 of its last 10 games. Reasons to bet St. Louis: The Blues are still playing for playoff positioning in the West and are 7-1-2 in their last 10 games. Florida has lost 5 straight, getting outscored by a combined total of 22-9. Reasons to bet Florida: The Panthers have won 8 of their last 10 games following a loss at home by 3 goals or more. The line (+110 on Florida) is suspiciously low for a struggling Panthers team with nothing to play for against a motivated St. Louis squad. Reasons to bet Nashville: The Predators are battling with St. Louis for the third spot in the Central Division and an easier first-round series. Dallas has lost 7 of its last 8 games when playing for the 4th time in 6 days. Reasons to bet Dallas: The Stars have held opponents to 2 goals or less in 7 of their last 9 games and have won 7 of their last 10 at home. Nashville has lost 8 of its last 11 games against the Stars and 26 of its last 34 visits to Dallas. Reasons to bet Minnesota: The Wild is 20-13-6 away from home while the Avalanche is 13-25-2 at home. Minnesota may be coming out of its recent slump, going 3-1-2 in its last 6 games. Reasons to bet Colorado: The Avalanche rallied from a 3-0 deficit to beat Chicago 4-3 in OT Tuesday and has scored 2+ goals in 5 straight and 8 of 9 – quite an accomplishment for the worst offence in the NHL. Minnesota has given up 3+ goals in 7 of its last 10 games. Reasons to bet Chicago: The Blackhawks have won 5 of the last 7 meetings between the teams. Chicago is 12-4 in its last 16 road games and could be motivated to rebound from a bad 4-3 OT loss Tuesday in Colorado, when the Hawks blew a 3-0 lead. Reasons to bet Anaheim: The Ducks have won 7 of their last 9 and have scored 3 goals or more in 7 of their last 8. Chicago has given up 16 goals in its last 4 road games, is without Toews and could be without defencemen Keith and Hjalmarsson. Reasons to bet Vancouver: Vancouver has won 5 of the last 6 meetings and 8 of 10, as well as 4 of its last 5 trips to Arizona. The Coyotes have scored 2 goals or less in 6 of their last 7 games and 8 of 10. Reasons to bet Arizona: The Coyotes could be motivated by the opportunity to move past Vancouver in the standings and out of last place in the Pacific. The Canucks have lost 5 straight, scoring 1 goal or less in each of those games and 7 of their last 9. Reasons to bet Calgary: The Flames are 20-15-4 on the road and still playing for playoff positioning in the West. The Kings are out of playoff contention. Reasons to bet Los Angeles: The Kings have won 3 of their last 4 games and broke out for 6 goals in a victory over Edmonton Tuesday. Calgary has lost 3 of its last 4 on the road, scoring just 6 regulation time goals in those 4 games. Reasons to bet Edmonton: The Oilers are 20-14-5 on the road and have won 8 of their last 10 games. San Jose has just 3 wins in its last 11 games, and 2 of them came against Vancouver. Reasons to bet San Jose: The Sharks have won 12 of their last 17 home games against Edmonton. San Jose has allowed 2 goals in its last 2 games after giving up 3+ goals in 6 straight.